England captain Charlotte Edwards is looking forward to a rest from cricket before focusing on this summer's Ashes. Edwards hit an unbeaten 106 as England took third place in the World Cup with a four-wicket win over New Zealand. "I'm having a break, because the last 18 months of my life have been completely dominated by cricket," the 33-year-old told BBC Sport. "I'm going to have a couple of months off and then will start really focusing on the Ashes." England were beaten in the final of the World Twenty20 by Australia in October before their defence of the World Cup in India ended at the Super Six stage. If the Aussies beat West Indies in Sunday's final, they will travel to England in August as Ashes, World Cup and World T20 holders. "We've got to go home, rest and refocus," added the Kent batter. "The Ashes are something those girls are looking forward to. "We're really disappointment about what's gone on out here, and we can't wait to take on those Australians come August." Edwards became the first woman to pass 5,000 one-day international runs in her innings against the Kiwis, taking England past their target of 221 with three overs to spare. Following England's exit from the tournament on Wednesday, the right-hander revealed she had not thought about retirement. 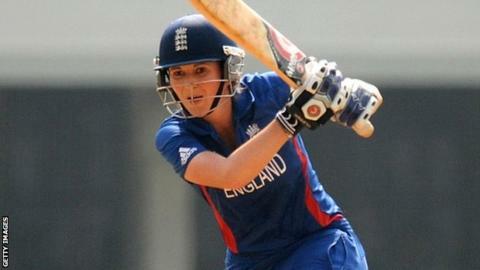 After scoring her second century of the competition, Edwards said the good form vindicates her desire to continue. "I came into this tournament having worked incredibly hard over the winter on my skills and my fitness," she said. "It's really nice to reap the rewards of that and I'm proud of the two hundreds I've scored. "The milestones are something for me to look at the end of my career. "I've got no plans of retiring. I'm playing as well as I have done. The Ashes and the 2014 T20 World Cup are next on my list." Where did it go wrong for England? Read more on Women's Cricket World Cup: Where did England go wrong?